Eric Fisher is the Chief Meteorologist at WBZ-TV in Boston, and we are excited that will be joining us at #UMBSocial on May 14th. As a young kid, I was already hooked on weather. I would stand out in the storms, send in reports to the local TV stations, and write down observations in a notebook. Now, I actually get paid to be a geek! I got my B.S. in Atmospheric Science from the University of New York at Albany, and then received my first broadcasting job at WGGB-TV in Springfield, MA. I worked there for 4 years, while also freelancing at WFXT-TV in Boston, MA for a year. 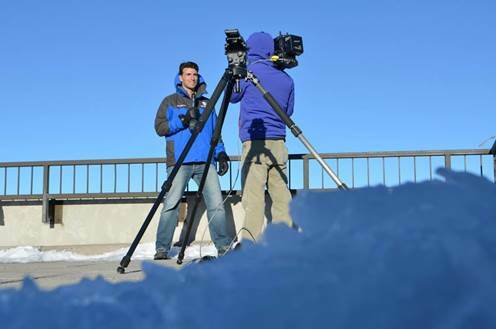 In 2010 I moved to Atlanta to work for the Weather Channel and travel all over the country to cover extreme weather. 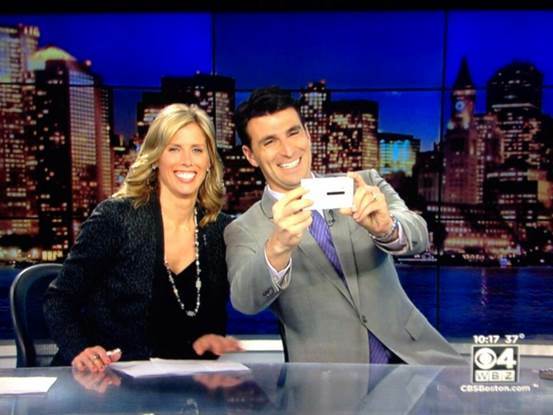 And that brings us up to now, where I accepted an offer to be Chief Meteorologist at WBZ-TV in Boston. 2. When did you start to work in social media? Like every other college kid my age, I started to use Facebook at school in Albany. At the time, it was just a way to look friends and strangers up. I didn’t actually start using it for work until 2009. That’s when I started a professional facebook profile and slowly started to tweet. Although I never really started to frequently use Twitter until my arrival at the Weather Channel in 2010. I’ve been hooked ever since! I also use Instagram, Vine, and Tout. 3. How does a typical work day of you look like? Usually I check in on the weather as soon as I wake up, to make sure nothing has changed. I may send out a couple tweets too to keep up online visibility. I often get into work by 130pm, and spend the shift making graphics, forecasting, writing weather blogs, doing radio hits, taping forecasts for Boston.com, sending out Twitter updates on things I find interesting or important, and actually delivering forecasts on the news! I leave the office around 1145pm. There are many days where this is all preceded by school visits, shooting stories, or other speaking engagements. 4. Do you have a role model in social media. Someone who inspires you? Jim Cantore is the man when it comes to weather and social media. He’s good at engaging people, letting his personality show, and knowing what’s a good tweet and what isn’t. He won’t waste your time with garbage information or clutter. And he’s by far the most followed Meteorologist in the country. 5. What is the hardest thing about social media? The most difficult thing is figuring out what will catch fire and what won’t. There’s a certain science to how many tweets you send out, what time of day you send them out, how many characters you use, what hashtag you use, the language you use, etc. All of these have to work in tandem to have a successful online presence. 6. What do you see as some up-and-coming trend in social media? Photos and video. I have to see it. It’s almost useless to send anything out without a photo or video inside of it. I also think location services will continue to grow so that as you post thoughts or information it will be aggregated into a more useful collection of data to interact with others. 7. Can you name us a brand or company that you admire for their great social media strategy/execution? I’m biased because I worked there, but the Weather Channel is always rated as one of the strongest brands in the country and there’s a good reason for it. They have excellent presence online, and a lot of that is due not only to the visual nature of their business, but also the importance of timely weather information. 8 Did you make any social media mistakes in the past or is there anything you would avoid in future? The thing I have to be most careful about in daily life is helping false information spread. There are a LOT of fake photos out there in the weather-sphere, and it takes a moment to sit back, examine a photo you’re sent, look at the shadows, look at the radar, and figure out if it’s real or not. This involves reverse searches and all sorts of other tactics, too. I have been fooled before, even with all this. 9. To be successful in social media, you need to ….? Engage your audience. Don’t just throw stuff out there, respond to people when they want to interact. I read constantly and I’m not sure I can come up with a favorite! But I tend to like books that broaden my understanding of worlds I don’t operate in (like the military, politics, areas of science that I don’t necessarily have a lot of experience in). I think it’s important to read about things outside your typical life to gain perspective. 11. Where can we find more about you and you work? This entry was posted in Speaker Interview and tagged #umbsocial, eric fisher.